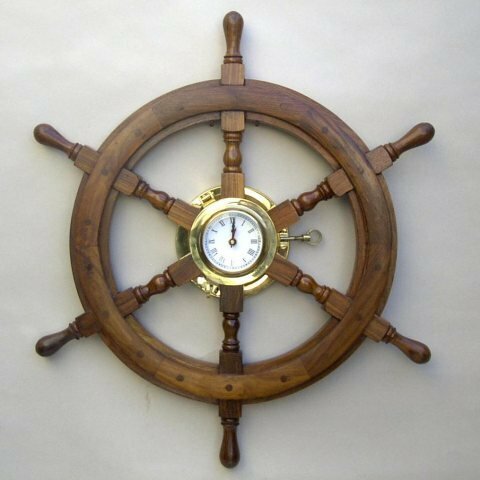 This is a very well made solid hardwood ship's wheel six spokes a beautifully constructed traditionally made port hole containing a battery powered quartz accurate mechanism clock in it's center. the wheel is assembled plugged screw heads. the port hole is constructed out of solid brass the clock face in where the glass pane in its center would be, the port hole functioning just as one in the side of a ship would have; the port hole can opened in the same way as a ship's porthole, giving it a truly classic feel. The total length from spoke tip to spoke tip is 24". If you have any questions about this product by IOTC, contact us by completing and submitting the form below. If you are looking for a specif part number, please include it with your message.